Look what we’ve been up to lately … a mountain! Last Saturday I decided to take Oliver skiing. I know some who have started their kids earlier but I knew Oliver wasn’t ready. He’s always been shy in new situations and intimidated by a crowd but as he gets older he seems more and more open to stepping outside of his comfort zone. This year it felt right. And our local ski hill (and by local I mean just across the border in Mars Hill – Big Rock) has really great rates this year! I really didn’t know what to expect that first time out but I prepared him as much as I could… for getting the rentals, for the “robot” boots, for falling. And he really impressed me with how open he was to trying it, even with a whole other class of kids skiing around him. 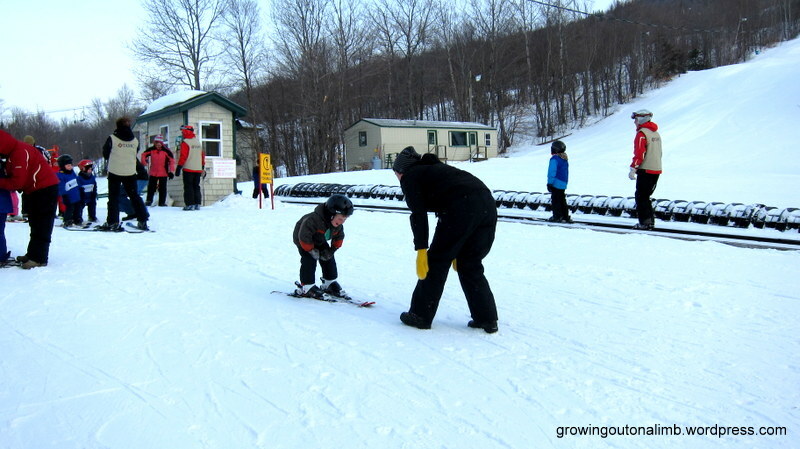 Hands on his knees… pizza shape with the skis (aka snowplow). He listened really well to everything I had to say and, when he fell down, he said, “That’s ok! I just get back up!”. He only skied an hour that first day but I was so pleased that he tried it at all that I didn’t mind. 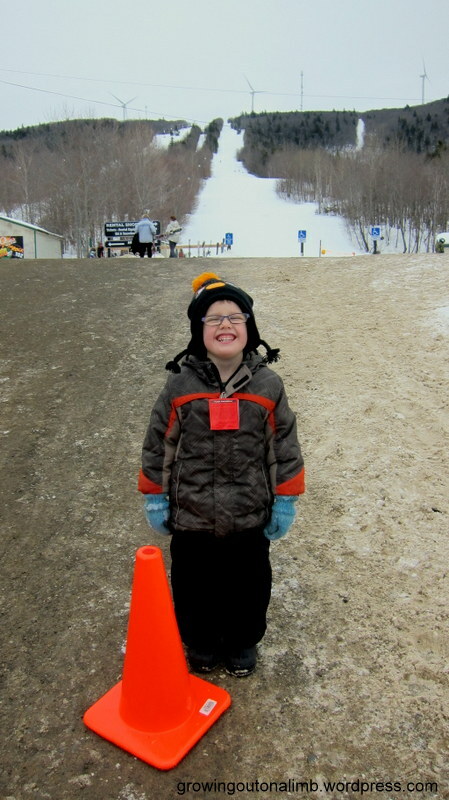 As we were leaving, I told him I wanted a picture with the mountain behind him and he said, “Mommy, let’s have a picture by this traffic cone!”, one that he noticed on the way in. Funny. 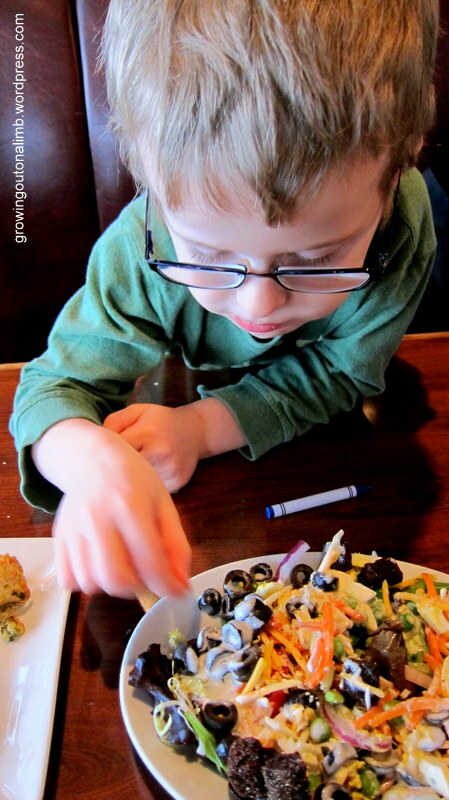 Then Oliver and I went to Ruby Tuesday’s for some lunch where we shared some salad and a grilled cheese sandwich. 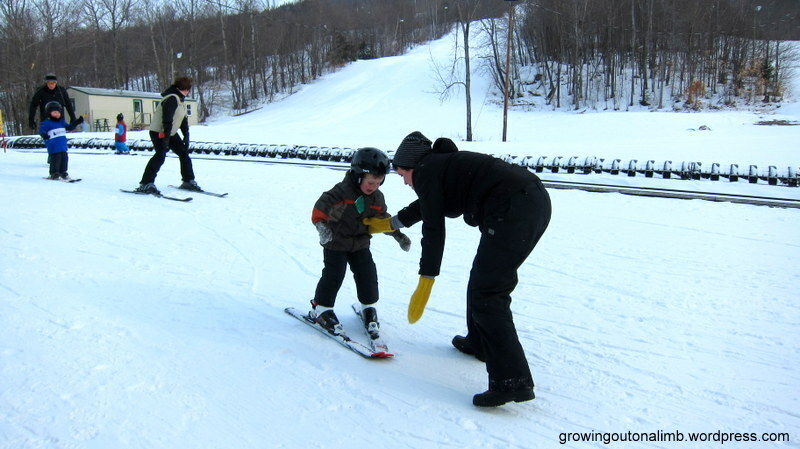 His first experience went so well that we decided to go buy him a set of skis that next week. I know, it seems impulsive, but we decided it was worth it because he enjoys it, they will go through two children, and they will save us a rental fee every time we go so really, they pay for themselves quickly! Yay for $5 trips to the mountain! So we broke those puppies in this past Saturday! He wasn’t quite in the same mood but we got a few more runs in than last time. And he continued to do well. He gets braver with every run. Here’s a video. Yup, I fell just after the camera turned off. Anyway, he is doing so well I’m thinking about taking him to the little class that goes on Saturday mornings, to see how he responds to that. It will be his first group (sort of) sport. I’m so glad he likes winter. And being outside. And skiing. And being with me. And I’m really glad he continues to surprise me. 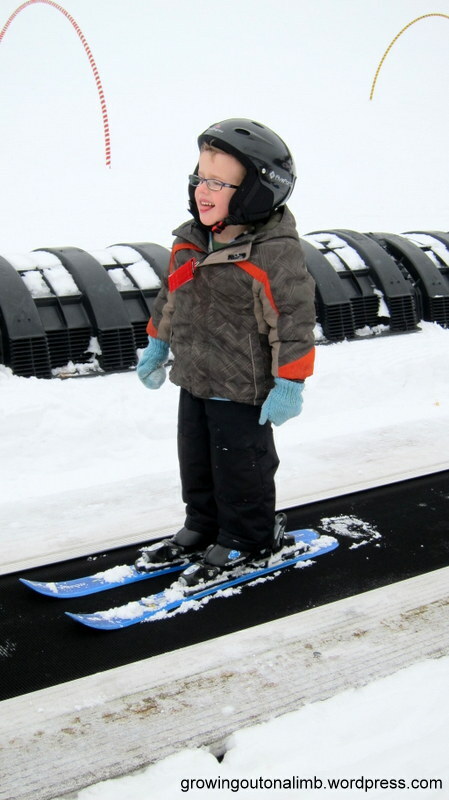 Categories: Firsts, Oliver, The Great Outdoors, Winter fun | Permalink. After an almost green Christmas, I was so happy to hear that there was a major winter storm coming. Of course, we happened to be in Cape Breton at the time, the land of high temps and rain. We were going to miss it completely! But surely it would still be there when we got home? It was! Not only that, the second snowstorm that we came home early to avoid was dumping snow on our first day home, which meant our first day home was a lovely combination of playing with our new Christmas toys and playing in the snow. I love it. The next day was New Year’s Eve day. It was colder but we bundled up anyway and had some outside time around home in the morning. Oliver is really loving sliding this year. I think Santa should have brought him more sleds but he does have a birthday coming up! That afternoon we went to our cousin’s house to slide with Tait and Aaron. Krys and Jonas had hot chocolate ready for us when we went inside. The boys had a great time sliding together and their hill is just big enough to have fun on but small enough that the boys don’t mind walking back up it a bunch of times. Emery displaying his lack of fear. While I was at the bottom of the hill, he had no problem letting Grammie put him on the sled and give him a push to come down all by himself! On New Year’s Day we got a few more inches of surprise snow! Or at least it was a surprise to me. It was light and fluffy and dropped in big ole flakes. We tried to slide in the front yard but it’s a long hill and the snow is powdery so it splashes up in the face (which Oliver does not like). This shot is purely to show how much snow is sitting on top of that wall along our driveway! It’s nice to live in a tree house in a snowstorm! Then, on New Year’s Day, we went to visit cousins on the other side of my family to slide at Nan’s. She has the best hill for sliding. I didn’t get any pictures that day of the other cousins (boo) but we sure did have fun sliding with them and the kids. Here’s Papa all geared up to go with the boys. Most. Fun. Papa. Ever! Oliver and I made snow angels too. He would get up, look behind, and say, “Mommy, look! It’s so beautiful!”. So, after three straight days of fun play outside and visiting with family, it’s not hard to understand why it was so hard to come into work today! I’d so much rather be outside and my boys would too. I just love that about them. Categories: Emerson, Family Fun, Holidays, Oliver, Playtime, Winter fun | Permalink. Christmas has come and gone for another year and I’m not sure it could have been any better. We had nine days off between Christmas and New Year’s Day and crammed just as much holiday and family fun as we possibly could into those days but it still felt like relaxed down time. It was so hard to go back to work! On Christmas eve we put on our new Christmas jammies, hung up our stockings, and put out a treat for Santa. Oliver was quite offended when I suggested egg nog for Santa… “No!… Santa likes milk!”. Dance party in our new jammies! On Christmas morning I was woken up to a loud, “Mommy, mommy… Santa got me Ferdinand for Christmas!”, which is the one thing he’s asked for for months. He had snuck out to the living room to have a peek before waking us up. Just he and I played for a while before Emery woke up. The boys opened their stockings, then we had breakfast. They were really excited to open the rest of their gifts so we took at them. Things seemed to be going so fast (too fast) at one point … Oliver was spinning, I was flustered, and Emery seemed really overwhelmed… so I suggested we open his big gift from us, Tidmouth sheds, thinking it would slow him down to play for a bit before continuing. I should have counted how many hours Oliver has played with this track set since Christmas. Hey, I’m not going to stop him … check out that smile! Emery likes the new track too. And they play together with it well. Most of the time. Then we hung out for a while at Nana and Papa’s for Christmas dinner. Yumm. Oliver and Emery liked hanging out with Aaliyah on the floor. Emery is my baby so why does he look monstrous laying beside Aaliyah? Nana and Papa had a few presents to open at their house too. You guessed it … more additions to the track that they keep at their house. Fun! He’s so handsome in his new clothes. We took off boxing day for Cape Breton and spent a few days with the Martell family. The boys traveled like champs, slept really well in strange beds, and mostly behaved themselves well for Nanny and Grampy and Uncle Jason. In one way it’s a nice break to get away from home and not have the usual monotony of household chores but in another it’s difficult to keep your kids corralled in someone else’s home when they are outside of the familiar and you are too. We really had a great time chatting, hanging out together, playing games, and eating of course. I really regret not getting pictures of that trip but it just went by so fast. While we were visiting there a snowstorm hit at home. I was bummed to miss it but we ended up leaving early to avoid a second snowstorm on the 30th (yay!) and even got a few inches New Year’s eve (more yay!) so … there are lots of sliding pictures to come in the next post! Categories: Emerson, Family Fun, Holidays, Oliver, Playtime, Special Occasions, Vacation | Permalink.